Activison is the first third party games producer, after Electronic Arts the biggest games manufacturer, publisher and paved the way for the further development of computer and video games. Toady, Activision Inc. acts worldwide and has its headquarters in Santa Monica, California. Further branch offices are in Canada, France, Great Britain, Germany, Japan, Australia and Scandinavia. Activison was founded in 1979, by the former Atari coders, David Crane, Larry Kaplan, Alan Miller, Bob Whitehead and the former music manager Jim Levy. The initiation for this step was, that Atari did not want to publish the names of its programmers. Activision printed images and names of the programnmers onto the packing, which attracted more talented programmers. Until the foundation of Activision hardware producers as Atari produced their games on their own. The foundation of Activison was the catalyst for a law suit betweem Atari and Activision. After all Atari made half of his turnover with the games of the Activision founders, Atari 2600 games. The lax suit was settled in 1982. At the beginning only games for the Atari VCS / Atari 2600 were produced. In the early 80s Activision expanded its product range, also to the C64, as the revenue for the declined. For the time being Activision was a big nuisance for Atari, but in the 80s Activision was going to be one of the few companies that went on to serve invariably all Atari platforms, while the competitors produced only seldom or not at all for Atari consoles, starting from Atari 5200. In 1982 Activision released the game Pitfall!, which not only counts as the first platformer, but also as the most sold Atari 2600 game at all. Activision had indeed already proofed that it can produce good games, but with Pitfall! came the first great success. This can be put down to the fact that Activision did not produce arcade clones, but the same created a new genre which at the same time also set the most successful genre for the next 20 years. In Germany Activision games were excluxively sold by [Ariolasoft]]. In 1985 merged with Infocom. Jim Levy was a big fan of the Infocom text adventures and wanted that Infocom to stay in business. Siy months later, BRuce Davis became CEO of Activision, who was against a merge with Infocom from the start. In 1989 Infocom had to close down, as no profits had been gained for several years. The reason for this was, that Bruce Davis determined some marketing decisions which caused bad sales number for Infocom games. 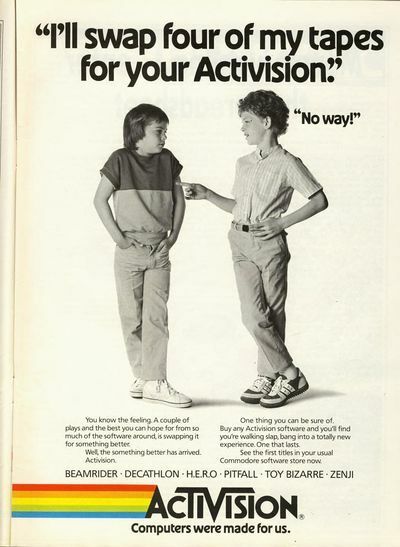 In 1988 Activision decided to also market application software next to the games. The company name was changed to Mediagenic. Games were still sold under the Activision label. This decision, however, proofed to be wrong. In 1992 Mediagenic had to file for insolvency. After the bankrupcy, Mediagenic was reorganised and merged with The Disc Company. After that the name was changed back to Activision. The development of PC games was continued and it was decided to concentrate solely on computer and video games. In 2004 Activision celebratet its 25th anniversary.